Want to get fit while playing video games? Wondering how that's possible? The answer isn't to buy an exercise game like Wii Fit, or Nike+ Kinect Training (although that is a legitimate option). There are plenty of opportunities while you game where you can be improving your health, you just might not have considered it before. 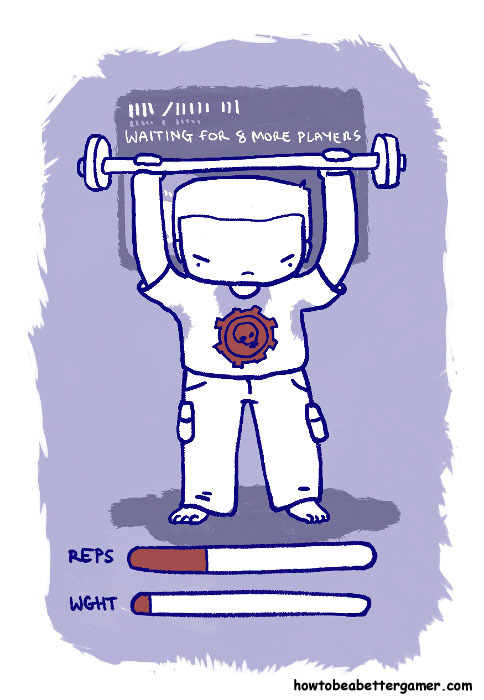 During every load screen, matchmaking queue, cut scene or whenever you aren't using the controller you can do a short, intense, physical activity that will keep you active without disrupting your gaming. One of the best opportunities where you can work out while you game is during online multiplayer matchmaking, like in Halo, Call of Duty, or Gears of War. On average, you might spend a minute or two waiting for the next game to start. You can get an effective exercise done during that time. Then as the match is about to start you can easily pick up the controller and resume play. When the match is over, do it again. All those breaks between matches and minutes will add up, especially if you play a long game session. THINK ONE MINUTE ISN'T ENOUGH? Set a timer for one minute, and do some push-ups until you can't do anymore. I'll wait. Did you do 50? Because if you did, that is great! 30 is pretty good too...but if you did anything below that, this might be just what you need. If you were able to do 50, in ten minutes, try it again. Could you do at least 25? Or did you use up all your strength all ready? An average Rumble Pit match in Halo 4 (at least when I play) lasts anywhere from 6-8 minutes. This is one of the most effective ways to get more fit and healthy while you game. It's important you try to stay active in your daily life, and try to find as many opportunities as you can to exercise and eat right. If gaming is a big part of your lifestyle you should try your best to make it a healthy one. There are many video games that want to promote a better lifestyle and make exercising fun, but honestly, a lot of those games aren't fun. Whether it be their dated presentation or motion controls that aren't as responsive as they advertise, they can make the dual exercise gaming experience a drag. And you are better off working out without them. Buying a new pair of running shoes isn't going to make you jog every day; you have to make the commitment to run on your own and build up the strength and endurance to a point where it becomes comfortable and fun. The same goes with Wii Fit Plus or Nike+ Kinect; you still have to turn those games on every day and make that commitment in order to see results. Simply buying them isn't going to make you active. And when I load up my Xbox 360 and I see that fitness game surrounded by BioShock Infinite, Batman: Arkham City or Halo 4, which one do you think I am more likely to choose? There are a variety of exercises that, while they might sound simple, can actually be challenging in this type of routine. Especially if you don't exercise at all. Like the push up test; how many crunches do you think you can do in a minute or two? How about jumping jacks? Could you keep that up, say, across an hour of gaming? Think about what areas you would like to improve on, whether it be your cardio or upper body strength, and choose exercises that would compliment that. Body weight exercises are some of the best type of exercises you can do in general, such as push-ups, planks, or squats. If you have some weights lying around, keep them by you while you game. There are dozens of free weight workouts, like bicep curls, triceps extensions, chest flys, and the shoulder press. If you work out every day with some weights while you game, you will notice the change within a couple of weeks. It's not magic; it's basic science. The more you work out a muscle, the more it'll grow. If you are looking to build strength, muscle definition, and endurance, short workouts with multiple reps is the best way to do that. You'd be doing something very similar to what people do at the gym, just spread out a little differently to accommodate your gaming. Because gaming comes first! It doesn't matter where you exercise or how you do it, the results will be same. Think about why you want to start that next slayer match in Halo. Did you lose, and are looking for redemption? Are you getting closer to ranking up, or unlocking a new armor? Are you trying to get an achievement? There are dozens or reasons why we push ourselves while playing games, and we might think it's solely because of fun but we don't realize there is a lot of work we are putting in to get that "fun" in return. The hard work towards reaching a goal or objective is what keeps us coming back to games. That's right, hard work. It ain't easy to rank up, and you have to work hard to get there. But because game designers make it fun to do so, we don't realize how much time and energy we are putting in. In modern games, you are constantly being reminded about the progress you make: how many kills you get with a certain weapon, how many victories you earn, how many special items you use, etc. Always we get reminded of the incremental progress with some sort of status bar or counter, and without realizing it, we are triggering a natural impulse to complete that progress bar or counter. 1,000 flag captures might sound daunting initially, but after a few days when the game is showing you little by little you are getting closer, you don't think about how long it's going to take, you are relishing in the fact that you are achieving parts of that goal now, and you feel rewarded. You can apply that same logic to exercising while you game. Your end goal can be to do 100 push-ups in a row, no stopping. Sounds daunting, but if you are doing push-ups between every match, and you game almost every day, you are always getting closer to your goal. And you won't realize you are putting in a lot of work because most of the time you will be focused on playing immediately after. You might be out of breath, or a little sweaty, but it won't feel like hard work. Because you will be having fun getting back to the game. Playing that next match is the reward. And over time, you will reach your goal. It's always easier to accomplish a challenging goal over a longer period of time, especially if broken down into parts. So as you would challenge yourself in your games, do so with your personal life. I bought a pull-up bar a while back, and could barely muster up three full reps. My goal was to do ten full reps without stopping or letting go of the bar. So everyday, while I played Halo, I would do a few reps on the pull-up bar while in matchmaking. Within about two weeks, I had reached my goal, and then some, easily! Also, and who knows if there are studies about this or anything, but when I exercise while I game, I perform better in the matches. I don't know if this is a result of my heart rate going up so I am more alert, but I swear when I sit down and play without exercise, I lose a lot more than when I get active and get my blood pumping. There could be some science behind it, or maybe I'm getting some sort of mental boost as well, but I am definitely a better gamer for it. I've been gaming all my life, and hopefully I will game for the rest of it. I don't want that life to be short lived though, especially because I have a family and there are a lot of things I still want to do. It's never too late to take control of your health and make some positive changes, and there is no reason why that can't be done in a way that is fun and doesn't feel like it intrudes on your personal or private time. So the next time you fire up that game, don't just sit around the whole time. Whenever you can, in the online lobby or during a load screen or cut scene, do some exercise. Think of it like a game in itself: every little bit you do, you're gaining a little bit more EXP. And leveling up unlocks more powerful weapons and items, or in the real world, a healthier and longer life. Don't you just love that picture at the top? I know I do. That's an original drawing by artist Katja Bach. Check out her website here. Or request her talented services over on Fiverr.